Sec. 1. Declaration of Policy. It is hereby declared to be the policy of this Act to promote and improve the social and economic status of public school teachers, their living and working conditions, their terms of employment and career prospects in order that they may compare favorably with existing opportunities in other walks of life, attract and retain in the teaching profession more people with the proper qualifications, it being recognized that advance in education depends on the qualifications and ability of the teaching staff and that education is an essential factor in the economic growth of the nation as a productive investment of vital importance. Sec. 2. Title Definition. 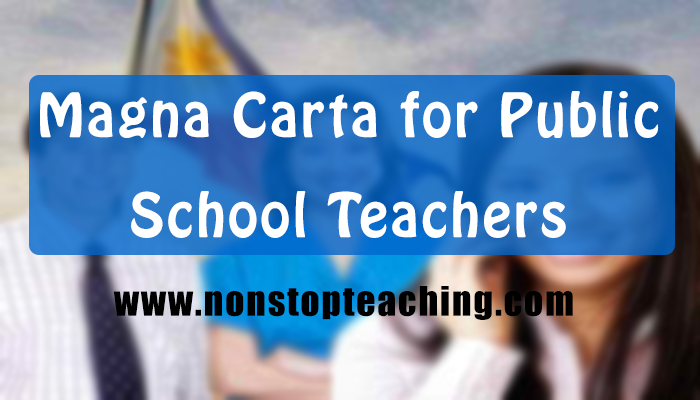 This Act shall be known as the "Magna Carta for Public School Teachers" and shall apply to all public school teachers except those in the professorial staff of state colleges and universities. As used in this Act, the term "teacher" shall mean all persons engaged in classroom teaching, in any level of instruction, on full-time basis, including guidance counselors, school librarians, industrial arts or vocational instructors, and all other persons performing supervisory and/or administrative functions in all schools, colleges and universities operated by the Government or its political subdivisions; but shall not include school nurses, school physicians, school dentists, and other school employees. (b) For teachers of the secondary schools, Bachelor's degree in Education or its equivalent with a major and a minor; or a Bachelor's degree in Arts or Science with at least eighteen professional units in Education. Provided, further, That in the absence of applicants who possess the minimum educational qualifications as hereinabove provided, the school superintendent may appoint, under a temporary status, applicants who do not meet the minimum qualifications: Provided, further, That should teacher-applicants, whether they possess the minimum educational qualifications or not, be required to take competitive examinations, preference in making appointments shall be in the order of their respective ranks in said competitive examinations: And provided, finally, That the results of the examinations shall be made public and every applicant shall be furnished with his score and rank in said examinations. Sec. 4. Probationary Period. When recruitment takes place after adequate training and professional preparation in any school recognized by the Government, no probationary period preceding regular appointment shall be imposed if the teacher possesses the appropriate civil service eligibility: Provided, however, That where, due to the exigencies of the service, it is necessary to employ as teacher a person who possesses the minimum educational qualifications herein above set forth but lacks the appropriate civil service eligibility, such person shall be appointed on a provisional status and shall undergo a period of probation for not less than one year from and after the date of his provisional appointment. Sec. 5. Tenure of Office. Stability on employment and security of tenure shall be assured the teachers as provided under existing laws. Subject to the provisions of Section three hereof, teachers appointed on a provisional status for lack of necessary civil service eligibility shall be extended permanent appointment for the position he is holding after having rendered at least ten years of continuous, efficient and faithful service in such position. Sec. 6. Consent for Transfer Transportation Expenses. Except for cause and as herein otherwise provided, no teacher shall be transferred without his consent from one station to another. Where the exigencies of the service require the transfer of a teacher from one station to another, such transfer may be effected by the school superintendent who shall previously notify the teacher concerned of the transfer and the reason or reasons therefor. If the teacher believes there is no justification for the transfer, he may appeal his case to the Director of Public Schools or the Director of Vocational Education, as the case may be. Pending his appeal and the decision thereon, his transfer shall be held in abeyance: Provided, however, That no transfers whatever shall be made three months before any local or national election. Necessary transfer expenses of the teacher and his family shall be paid for by the Government if his transfer is finally approved. Sec. 7. Code of Professional Conduct for Teachers. Within six months from the approval of this Act, the Secretary of Education shall formulate and prepare a Code of Professional Conduct for Public School Teachers. A copy of the Code shall be furnished each teacher: Provided, however, That where this is not possible by reason of inadequate fiscal resources of the Department of Education, at least three copies of the same Code shall be deposited with the office of the school principal or head teacher where they may be accessible for use by the teachers. d. the right to appeal to clearly designated authorities. No publicity shall be given to any disciplinary action being taken against a teacher during the pendency of his case. Sec. 9. Administrative Charges. Administrative charges against a teacher shall be heard initially by a committee composed of the corresponding School Superintendent of the Division or a duly authorized representative who should at least have the rank of a division supervisor, where the teacher belongs, as chairman, a representative of the local or, in its absence, any existing provincial or national teacher's organization and a supervisor of the Division, the last two to be designated by the Director of Public Schools. The committee shall submit its findings and recommendations to the Director of Public Schools within thirty days from the termination of the hearings: Provided, however, That where the school superintendent is the complainant or an interested party, all the members of the committee shall be appointed by the Secretary of Education. Sec. 10. No Discrimination. There shall be no discrimination whatsoever in entrance to the teaching profession, or during its exercise, or in the termination of services, based on other than professional consideration. Sec. 11. Married Teachers. Whenever possible, the proper authorities shall take all steps to enable married couples, both of whom are public school teachers, to be employed in the same locality. Sec. 12. Academic Freedom. Teachers shall enjoy academic freedom in the discharge of their professional duties, particularly with regard to teaching and classroom methods. Sec. 13. Teaching Hours. Any teacher engaged in actual classroom instruction shall not be required to render more than six hours of actual classroom teaching a day, which shall be so scheduled as to give him time for the preparation and correction of exercises and other work incidental to his normal teaching duties: Provided, however, That where the exigencies of the service so require, any teacher may be required to render more than six hours but not exceeding eight hours of actual classroom teaching a day upon payment of additional compensation at the same rate as his regular remuneration plus at least twenty-five per cent of his basic pay. Sec. 14. Additional Compensation. Notwithstanding any provision of existing law to the contrary, co-curricula and out of school activities and any other activities outside of what is defined as normal duties of any teacher shall be paid an additional compensation of at least twenty-five per cent of his regular remuneration after the teacher has completed at least six hours of actual classroom teaching a day. In the case of other teachers or school officials not engaged in actual classroom instruction, any work performed in excess of eight hours a day shall be paid an additional compensation of at least twenty-five per cent of their regular remuneration. The agencies utilizing the services of teachers shall pay the additional compensation required under this section. Education authorities shall refuse to allow the rendition of services of teachers for other government agencies without the assurance that the teachers shall be paid the remuneration provided for under this section. (c) they shall be properly graded so as to recognize the fact that certain positions require higher qualifications and greater responsibility than others: Provided, however, That the general salary scale shall be such that the relation between the lowest and highest salaries paid in the profession will be of reasonable order. Narrowing of the salary scale shall be achieved by raising the lower end of the salary scales relative to the upper end. Sec. 16. Salary Scale. Salary scales of teachers shall provide for a gradual progression from a minimum to a maximum salary by means of regular increments, granted automatically after three years: Provided, That the efficiency rating of the teacher concerned is at least satisfactory. The progression from the minimum to the maximum of the salary scale shall not extend over a period of ten years. Sec. 17. Equality in Salary Scales. The salary scales of teachers whose salaries are appropriated by a city, municipal, municipal district, or provincial government, shall not be less than those provided for teachers of the National Government. Sec. 18. Cost of Living Allowance. Teacher's salaries shall, at the very least, keep pace with the rise in the cost of living by the payment of a cost-of-living allowance which shall automatically follow changes in a cost-of-living index. The Secretary of Education shall, in consultation with the proper government entities, recommend to Congress, at least annually, the appropriation of the necessary funds for the cost-of-living allowances of teachers employed by the National Government. The determination of the cost-of-living allowances by the Secretary of Education shall, upon approval of the President of the Philippines, be binding on the city, municipal or provincial government, for the purposes of calculating the cost-of-living allowances of teachers under its employ. Sec. 19. Special Hardship Allowances. In areas in which teachers are exposed to hardship such as difficulty in commuting to the place of work or other hazards peculiar to the place of employment, as determined by the Secretary of Education, they shall be compensated special hardship allowances equivalent to at least twenty-five per cent of their monthly salary. Sec. 20. Salaries to be Paid in Legal Tender. Salaries of teachers shall be paid in legal tender of the Philippines or its equivalent in checks or treasury warrants. Provided, however, That such checks or treasury warrants shall be cashable in any national, provincial, city or municipal treasurer's office or any banking institutions operating under the laws of the Republic of the Philippines. Sec. 21. Deductions Prohibited. No person shall make any deduction whatsoever from the salaries of teachers except under specific authority of law authorizing such deductions: Provided, however, That upon written authority executed by the teacher concerned, (1) lawful dues and fees owing to the Philippine Public School Teachers Association, and (2) premiums properly due on insurance policies, shall be considered deductible. Sec. 22. Medical Examination and Treatment. Compulsory medical examination shall be provided free of charge for all teachers before they take up teaching, and shall be repeated not less than once a year during the teacher's professional life. Where medical examination show that medical treatment and/or hospitalization is necessary, same shall be provided free by the government entity paying the salary of the teachers. Sec. 23. Compensation For Injuries. Teachers shall be protected against the consequences of employment injuries in accordance with existing laws. The effects of the physical and nervous strain on the teacher's health shall be recognized as a compensable occupational disease in accordance with existing laws. Sec. 24. Study Leave. In addition to the leave privileges now enjoyed by teachers in the public schools, they shall be entitled to study leave not exceeding one school year after seven years of service. Such leave shall be granted in accordance with a schedule set by the Department of Education. During the period of such leave, the teachers shall be entitled to at least sixty per cent of their monthly salary: Provided, however, That no teacher shall be allowed to accumulate more than one year study leave, unless he needs an additional semester to finish his thesis for a graduate study in education or allied courses: Provided, further, That no compensation shall be due the teacher after the first year of such leave. In all cases, the study leave period shall be counted for seniority and pension purposes. The compensation allowed for one year study leave as herein provided shall be subject to the condition that the teacher takes the regular study load and passes at least seventy-five per cent of his courses. Study leave of more than one year may be permitted by the Secretary of Education but without compensation. Sec. 25. Indefinite Leave. An indefinite sick leave of absence shall be granted to teachers when the nature of the illness demands a long treatment that will exceed one year at the least. Sec. 26. Salary Increase upon Retirement. Public school teachers having fulfilled the age and service requirements of the applicable retirement laws shall be given one range salary raise upon retirement, which shall be the basis of the computation of the lump sum of the retirement pay and the monthly benefits thereafter. Sec. 27. Freedom to Organize. Public school teachers shall have the right to freely and without previous authorization both to establish and to join organizations of their choosing, whether local or national to further and defend their interests. (b) to cause the dismissal of or otherwise prejudice a teacher by reason of his membership in an organization or because of participation in organization activities outside school hours, or with the consent of the proper school authorities, within school hours, and (c) to prevent him from carrying out the duties laid upon him by his position in the organization, or to penalize him for an action undertaken in that capacity. Sec. 29. National Teacher's Organizations. National teachers' organizations shall be consulted in the formulation of national educational policies and professional standards, and in the formulation of national policies governing the social security of the teachers. Sec. 30. Rules and Regulations. The Secretary of Education shall formulate and prepare the necessary rules and regulations to implement the provisions of this Act. Rules and regulations issued pursuant to this Section shall take effect thirty days after publication in a newspaper of general circulation and by such other means as the Secretary of Education deems reasonably sufficient to give interested parties general notice of such issuance. Sec. 31. Budgetary Estimates. The Secretary of Education shall submit to Congress annually the necessary budgetary estimates to implement the provisions of the Act concerning the benefits herein granted to public school teachers under the employ of the National Government. Sec. 32. Penal Provision. A person who shall willfully interfere with, restrain or coerce any teacher in the exercise of his rights guaranteed by this Act or who shall in any other manner commit any act to defeat any of the provisions of this Act shall, upon conviction, be punished by a fine of not less than one hundred pesos nor more than one thousand pesos, or by imprisonment, in the discretion of the court. If the offender is a public official, the court shall order his dismissal from the Government service. Sec. 33. Repealing Clause. All Acts or parts of Acts, executive orders and their implementing rules inconsistent with the provisions of this Act are hereby repealed, amended or modified accordingly. Sec. 34. Separability Clause. If any provision of this Act is declared invalid, the remainder of this Act or any provisions not affected thereby shall remain in force and in effect. Sec. 35. This Act shall take effect upon its approval. whatif the said teachers has no eligibility such as LET and TM?but she/he really loves to teach..